Date: 29th June - 1st July 2007. Location: The White Horse, Market Street, Swavesey, Cambs, UK. 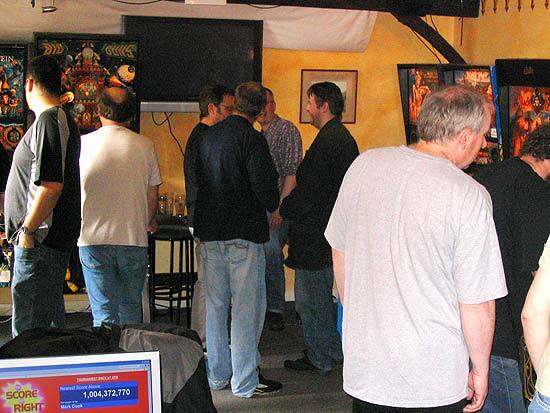 Last April, the first East Anglian Pinball Meet was held in a small village on the outskirts of Cambridge. 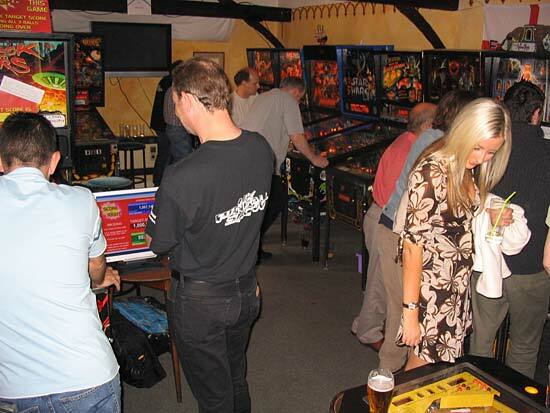 Pinball fans from across central and southern England came along to support the new event and raise some money for a good cause. 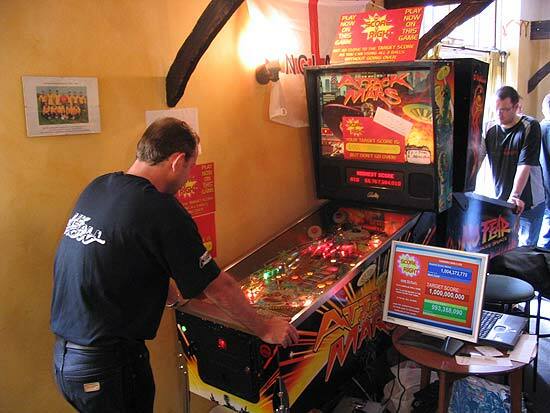 It was organised by Mark Squires who not only lives nearby but is a pinball collector, restorer and repairer. 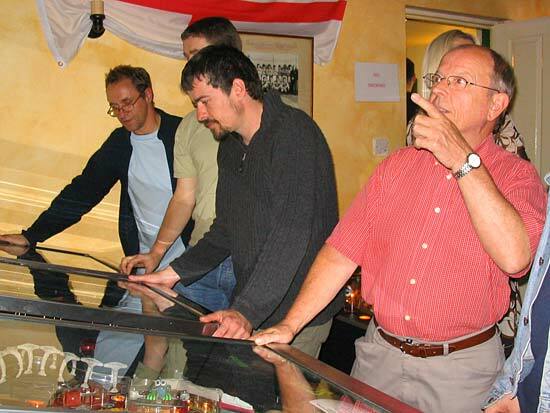 Mark brought back the meet for 2007, a little later in the year and with a new mix of solid state games for regular players to enjoy and to tempt the locals into finding out what pinball is all about. The venue was the back room of the White Horse Inn in the village of Swavesey. 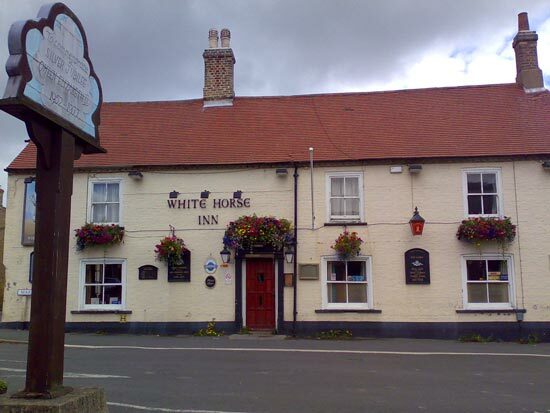 A very traditional village pub, the White Horse Inn boasts a landlord - Will Wright - who is also a pinball fan and owns a Night Moves cocktail pinball which he put in the main bar. 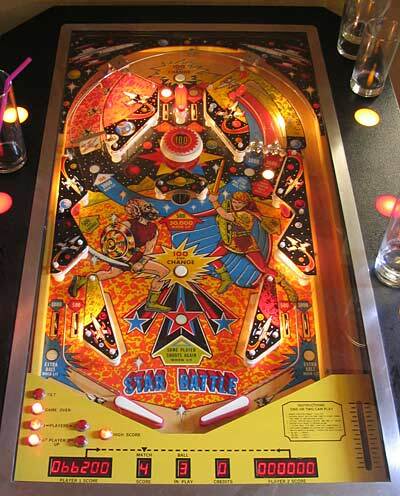 He explained how it serves two purposes - entertainment for the pinball fans, and a regular table for those not into the game. and they were provided by Nigel Hill, Nick Bennett, Stan Simpson (2), Adrian Godwin, Aid Cooper, Lee Fensom, Phil Dixon, Ross Hamilton, Martin Riley, David Edwards, Phil Docker, Roger Thornton, David Blake and Mark Squires respectively. 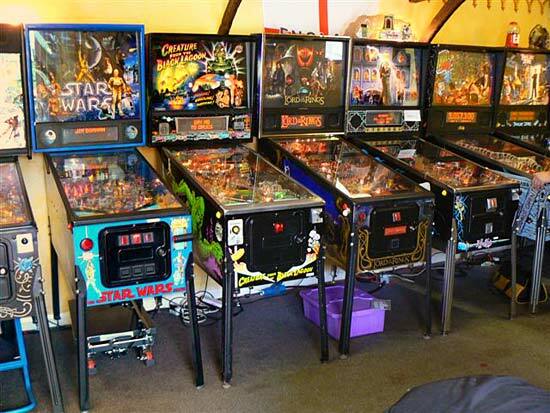 Set-up and the initial opening took place on Friday night but the main action began on Saturday lunchtime as visitors drove from across the area to enjoy the collection and talk pinball. 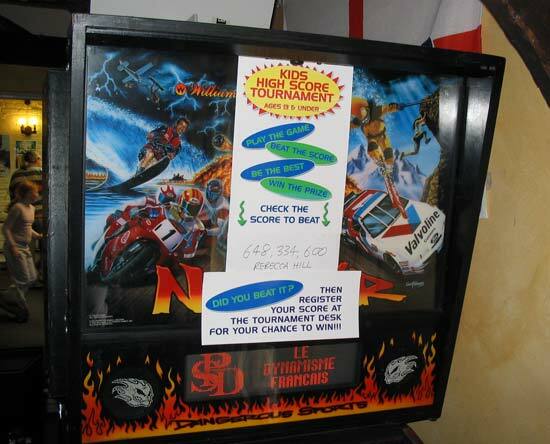 There was no entry fee, but the games were set on paid play with the proceeds intended to refund the expenses of those bringing the games, and the remainder going to charity. 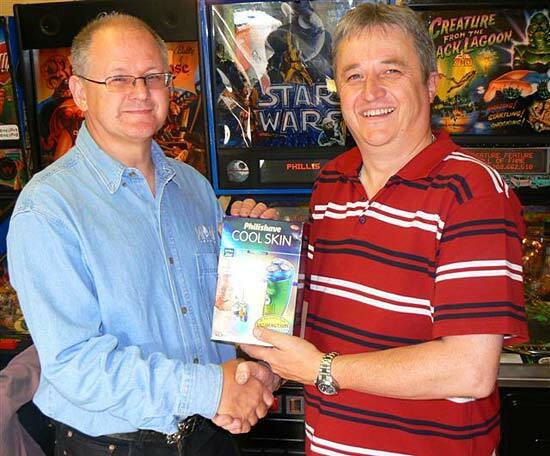 In a generous move, all the game owners voted to forego their expenses and donate the entire takings to the Milton Children's Hospice, the chosen charity for the event. The main bar saw a return of last year's Pinball Wizard real ale alongside the Deuchars IPA and the regular selection of lagers, cider, spirits and soft drinks for those with a thirst for something other than pinball. The neighbouring dining room also saw good business and the food proved to be of a high quality. The original plans for a barbeque were ruled out earlier in the week due to the poor weather forecast for Saturday and true to form, it rained almost all day. Sunday was a much better day which was fortunate as it coincided with the introduction of a nationwide smoking ban in public enclosed premises, forcing the smokers outside onto the patio area which, by mid-afternoon, became the place to congregate. 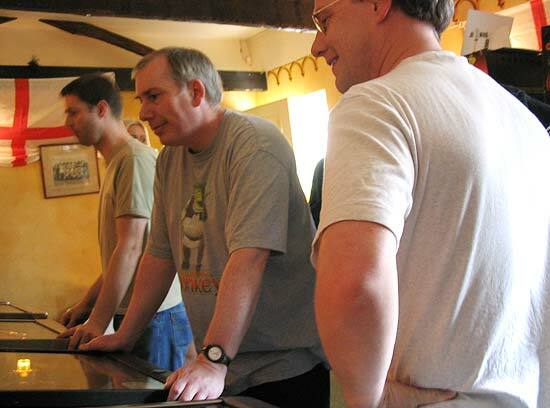 If the rain on Saturday forced players inside, there were two tournaments arranged by Pinball News for them to enjoy. The Kids had a high score competition set up on Phil Docker's No Fear machine. 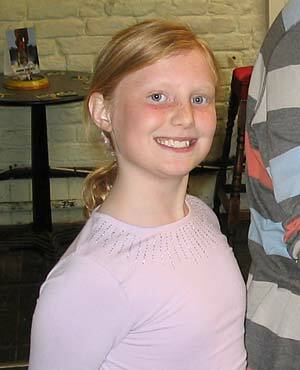 The tournament was won by Rebecca Hill who scored 648,334,600 to beat her brother Jack and win the top prize of a wristwatch TV courtesy of organiser Mark and Nokia. The second tournament was dubbed "The Score Is Right" and set a target score for players to aim for - but not exceed - on the chosen game, Aid Cooper's Attack From Mars, using all three balls and without tilting. The target was set at 1 billion points which sounds a lot but anyone who knows the game will realise it's quite easy to achieve. It wasn't so easy not to exceed the target though, as many players and the repeated cries of agony testified. A misplaced shot or an underestimated bonus could ruin all the careful planning. 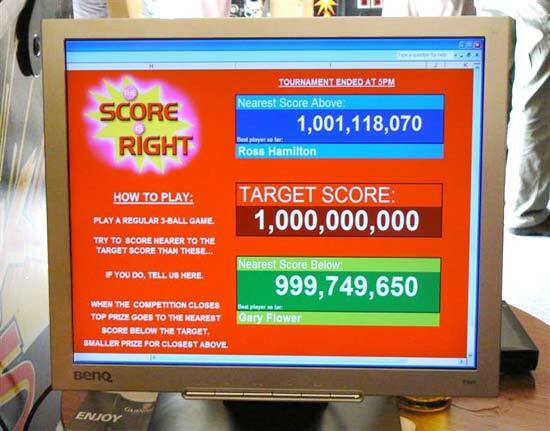 There was a major prize for the nearest score below 1 billion, and a smaller prize for the nearest score over. A display next to the machine showed the target and the best scores achieved so far. Aid Cooper showed the others how to play and took first place with 993 million, winning the top prize of a brand new Nokia phone. Nick Marshall was the runner up with the nearest score just over 1 billion. The Score Is Right was only intended to run for one day but the donation of prizes by Lee Fensom and Gary Flower meant it could return on Sunday too and it was Gary Flower who set an unbeatable score as you can see below. Nobody was able to get closer and so he took Sunday's top prize of a Phillips electric shaver system and accessories. 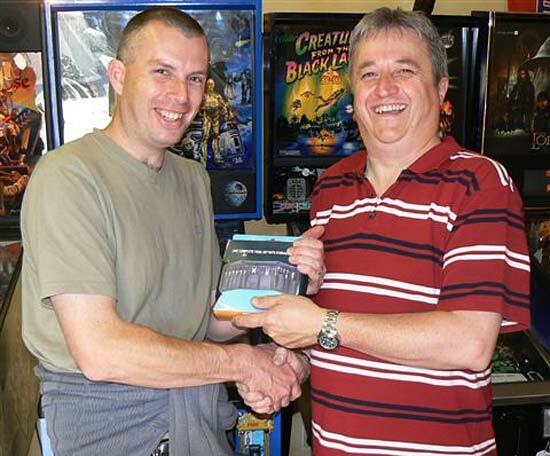 Ross Hamilton got the closest score over the target and won the runner up prize of a miniature toolkit. All the machines worked well for the duration of the weekend. While many had stories behind them, Lee Fensom's Star Battle game was present thanks to some detective work to track down a ROM, so the Century Consolidated Industries Company game could be restored to working order and brought along for the weekend. 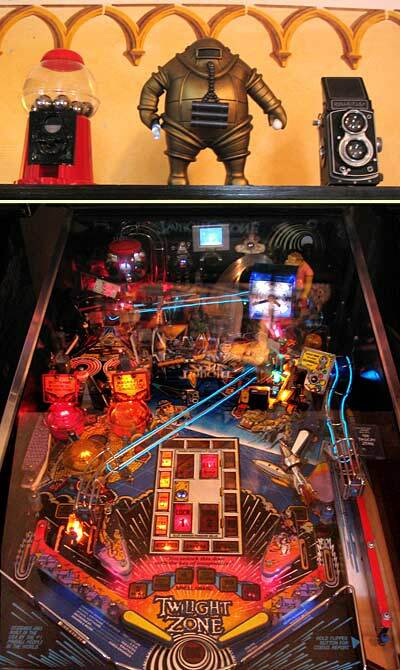 The selection of machines was varied and included some highly modified games such as Stan Simpson's amazing Twilight Zone complete with miniature TV showing episodes of the series. 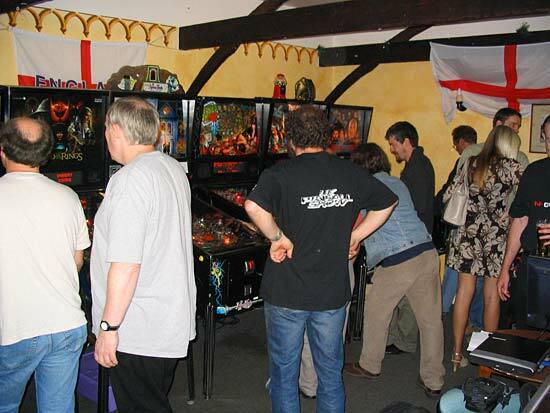 Sunday also saw the final round of the London & South East region of the UK Pinball League played on five of the machines - Frankenstein, Big Guns, The Machine - Bride Of Pinbot, Roadshow and Black Rose. Jayne Raison who were all on 50 points. The event wound up late Sunday afternoon as games were packed up and loaded into cars for their return journey. When all the cash boxes were emptied, £550 ($1,100) had been raised for the Milton Children's Hospice. 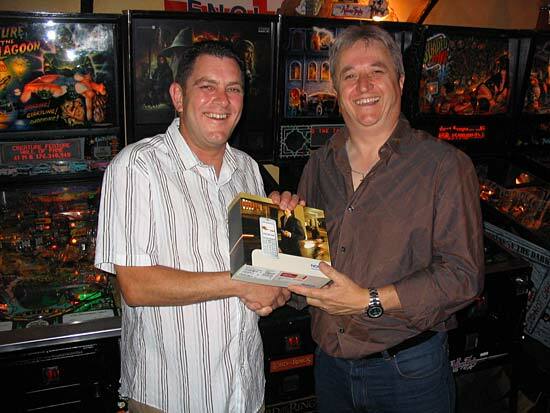 So, a great weekend of playing pinball, talking pinball and even (thanks to the special beer) drinking pinball, resulted in the further promotion of the game and also raised a good sum for charity. Thanks to Mark Squires for organising it, Will and Pat for hosting, David for organising the League and all those who brought games.